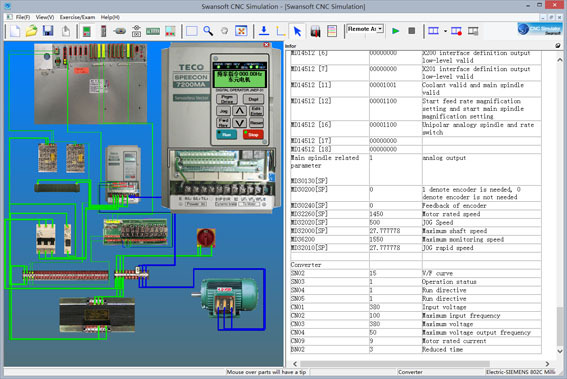 Swansoft Machine Simulator(SSMAC for short)is developed by Nanjing Swansoft Technology Company. It provides a simulation enviroment of CNC machine including the construction, adjust, measurment and fault detection of CNC machine. Electric component can be layout freely on virtual board. It supports most of well-known CNC system, such as (FANUC), Simens (SINUMERIK) lathe and milling center etc. Network version is more suitable for vocational and technical school or college to teach PLC programming. 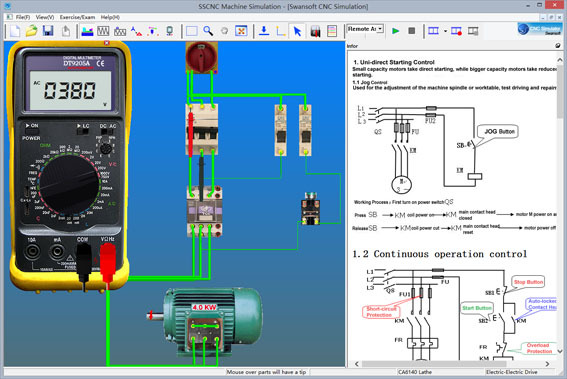 SSMAC is easy to use for students and teacher, teacher can set model fault and train students to find out their abilities, they can also receive students' operation information through SSMAC Server. 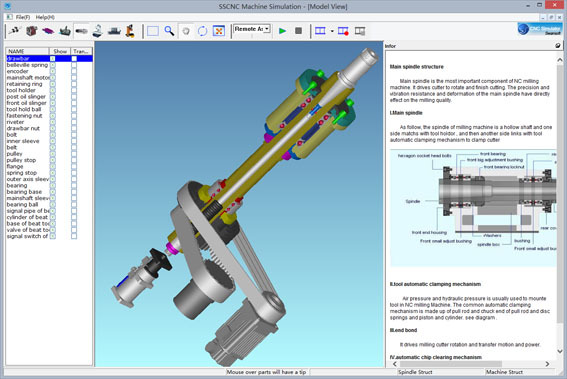 1.SSMAC use Siemens, FANUC, and HNC system as model for development, with combining the newest 3D simulation technology, information and system techiniques and other professional technologies in its own application field, providing the detailing of CNC milling machine structures, operating principles, operation methods and fault detection. 2.Combining with 2D and 3D graphics, SSMAC provides vivid and detailed display of CNC milling machine parts and working principle, electrical system functioning principle, the operation of numerical control system, and numerical control machine fault detection and exclusion. While improving the learning experiences and teaching efficiency, it saves a large expense in purchasing actual equipments. 3.A large amount of data is accquired through the experiment test of the system, by imposing theoretical analysis to them, we ensure the accuracy and authenticity of the system. 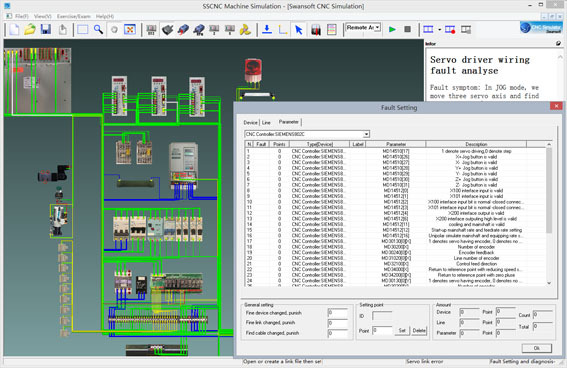 4.System shows the connection of the numerical control system process vividly, through the simulation of connection students can master the real connecting process in no time. 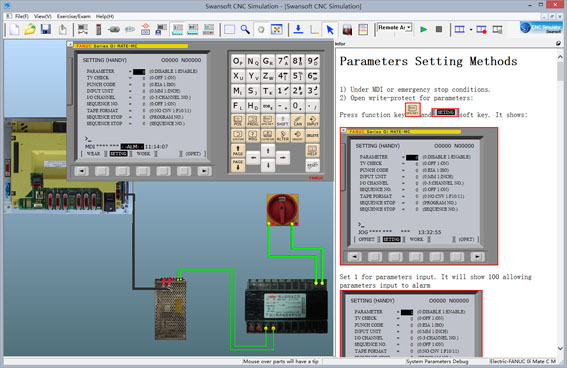 5.Actual appearence of NC machine operation panel is shown in the simulation. By simulating NC system in the operation panel before operating on the real machine, time and training cost can be saved and hence improve training efficiency. 6.System used OpenGL graphic programming techniques to ensure the system updated and the outstanding performance during operation. The system introduces mechanical structures, working principle, the movement process, including the general structure, machine tool servo system, main shaft transmission system, and machine tool assembly of Siemens milling machine. 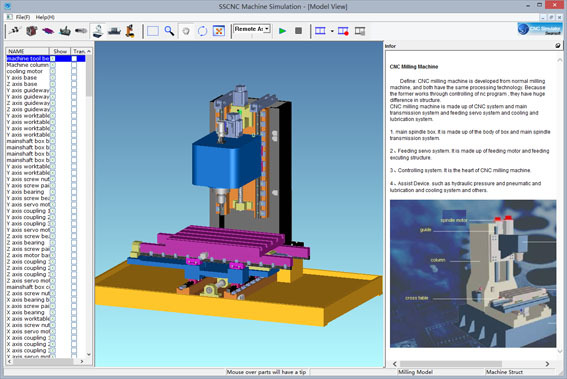 System used 3D virtual graphic method to show each of each system components and the position relationship between them. The circuit running principle, how system is connected, system parameters etc. is introduced. System parameters simulates the the setting process of actual parameters and also their effects.